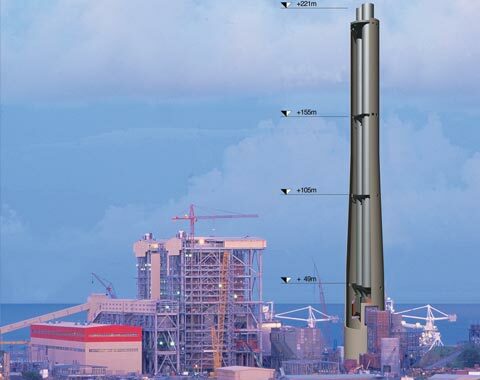 PennguardTM protects the steel chimney flues of the largest coal fired power station in the Philippines. 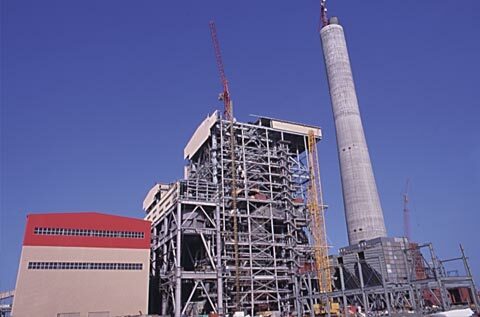 On northwest Luzon, 190 kilometres from the Philippine capital Manila, one of Asia’s largest private power companies has constructed a 2 x 609 MW coal fired power station. When it enters commercial operation in 1999, the Sual Power Station will be the largest of its kind in the Philippines and a major supplier of power to the region. In order to be environmentally efficient, the station is equipped with a modern flue gas desulphurisation system. 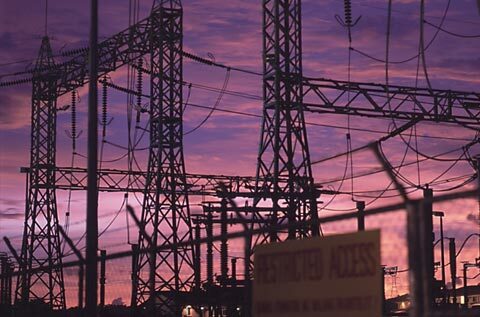 The owner and developer of Sual Power Station is Consolidated Electric Power Asia Limited (CEPA), a subsidiary of Southern Company from the United States. 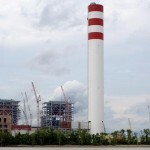 CEPA already operates a number of large power stations in several Asian countries, including China and the Philippines. 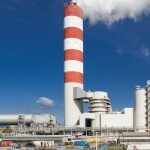 The Sual Power Station will fire a range of imported coals, with a varying sulfur content. In order to meet the emission standards for SO₂, up to 70 % of the flue gas will be desulphurized in a wet flue gas desulphurization (FGD) plant. Before entering the chimney, the cool, wet treated gas is mixed with the remainder of the gas stream, which is still hot. The mixed gas stream in the chimney flues has a temperature of 75-85 °C and an SO₂ content of 800 mg/Nm³. When low sulfur coal is burned, the FGD plant is bypassed and the entire gas stream is exhausted directly through the chimney. In this case, the flue gas has a temperature of 132 °C . The chimney of the Sual Power Station was designed by Ove Arup & Partners (Arup) from London, an engineering firm with great experience in Southeast Asia. One of the main challenges for the design to meet was the strong seismic activity in the region. Furthermore, a flue lining had to be selected, which would be resistant to the wide range of temperatures and chemical loads. During the selection of a suitable lining for the steel chimney flues, it became clear that the Sual pro-ject presented several specific challenges. The main points of consideration were the chemical environment in the flues, the seismic activity of the region and the adverse local climate conditions. The reheating method employed for the Sual Power Station is simple and effective; by mixing the desulphurized, cool gas stream with the remaining hot, unscrubbed gas (70 % and 30 % of the total gas stream respectively), a mixed gas stream with a temperature of 75-85 °C is created. As a result of the mixing, most of the condensate present in the scrubbed gas stream is evaporated. However, small amounts of agressive and corrosive condensate remain. As a result of the evaporation, the sulfuric acid concentration of this condensate is very high. The combination of a 75-85˚C temperature and a high sulfuric acid concentration is very agressive to most materials of construction. A PennguardTM lining however, is based on borosilicate glass, which has unlimited resistance against high concentrations of sulfuric acid, even at high temperatures. As a 41 mm thick, impermeable lining of cellular borosilicate glass, a PennguardTM lining will provide reliable long term protection even under these agressive chemical conditions. The Sual Power Station is located in one of the most seismically active regions in the world. Under this challenging condition, Ove Arup & Partners have taken great care to create a chimney design which is both safe and economical. As a general rule for chimneys in seismically active locations, light materials of construction are preferred, as this will reduce the forces on the chimney shell and foundation during an earthquake. A PennguardTM lining meets this requirement; the total weight of a PennguardTM lining is only 11,9 kg/m² (using 1,5″ thick PennguardTM Blocks). The excellent insulating properties of a PennguardTM lining offer additional benefits: external insulation can be omitted, which further reduces weight and seismic load and thermal stresses in the steel flues are significantly reduced. The PennguardTM lining itself can easily accomodate the deflections that may occur in the steel flues during an earthquake, as the adhesive, PennguardTM Adhesive Membrane, has good flexibility. During most of the year, the climate on northwest Luzon can be characterized as hot, with a very high relative humidity. This will make the climate within the chimney flues difficult to control during the application of the internal lining. The application process of a PennguardTM lining can be divided into two separate phases without problem. During the first phase, smaller sections of the steel flues are grit blasted and protected with PennguardTM Block Primer in a workshop. Then, after assembly of the flues, moving work platforms are installed and the PennguardTM lining can be applied directly over the prepared and primed steel. 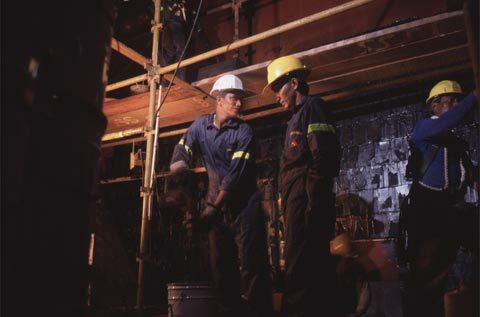 This means, that the surface preparation by grit blasting is performed outside of the chimney itself, which eliminates any concerns for condensation of moisture on freshly prepared steel surfaces. During the installation of the PennguardTM lining, the primercoated steel surface must be dry. The drying and curing of PennguardTM Adhesive Membrane, the adhesive of the PennguardTM lining system, is not negatively affected by high relative humidity. Even on a very large project such as the Sual Power Station chimney, a PennguardTM lining can be installed efficiently and effectively. As described on page 3, the surface preparation for a PennguardTM lining can be performed in a workshop, before construction of a chimney flue (or flue gas duct, as the case may be). 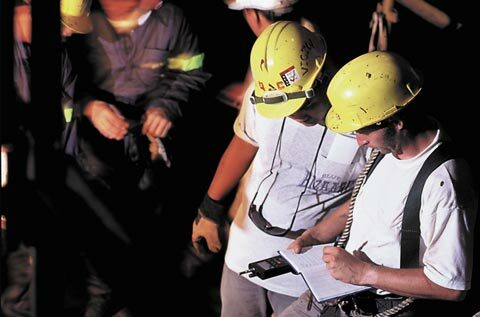 This will not only eliminate possible quality risks, but it will also reduce the amount of equipment and manpower needed in and around the chimney itself. This can be an important consideration, especially when limited space is available and construction schedules are tight. The application of the PennguardTM lining itself can in most cases be performed by local personnel, under supervision of quality inspectors from Hadek. The involvement of local applicators is often a great advantage, as it reduces the cost of travel and accomodation, while increasing the flexibility of work planning. The diameter of the steel flues in the Sual chimney is 8 metres, which allows 8 applicators to be active on the platform. 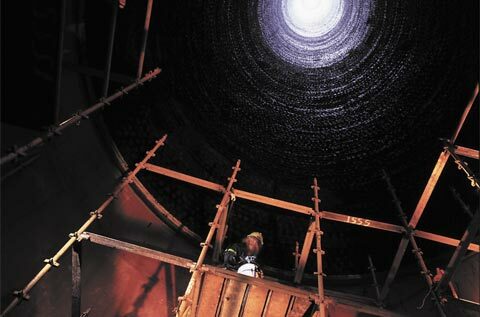 In a large steel chimney flue, an average productivity of 2,0 m² per hour per applicator can be achieved. This means, that the total installation period for a PennguardTM lining in one 5.000 m² flue is a little over 31 days, assuming 10 work hours per day.